Yes, I’m aware that March has passed but let’s not talk about that. The March theme for TSNEM (try something new every month, read more about it here. was painting. This was a difficult one for me to come up with a project for because I’ve done tried to many painting techniques in art classes throughout the years. You can see some of them here where I showed off illustration projects I’ve done. 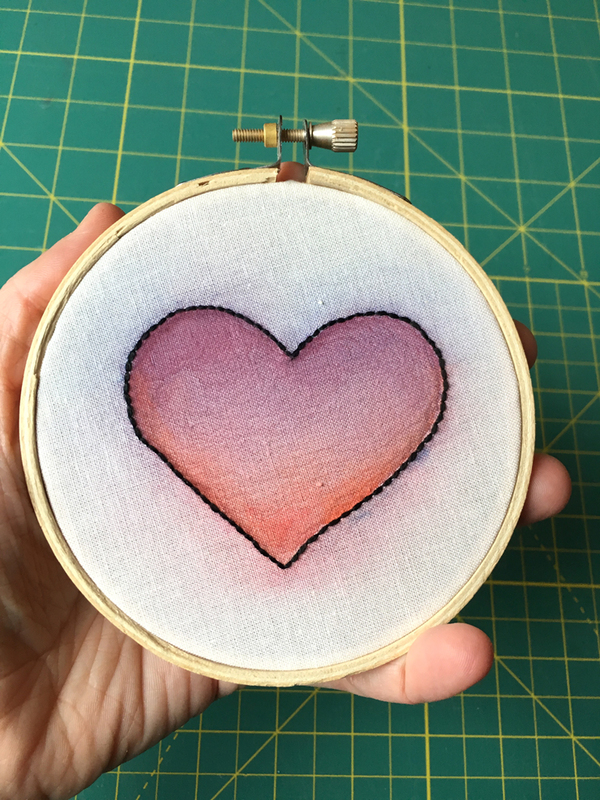 I decided to try out using watercolor paint to add color to an embroidery. I was Googling around for tips and the first thing I came across was a post from my friend Mollie at Wild Olive. 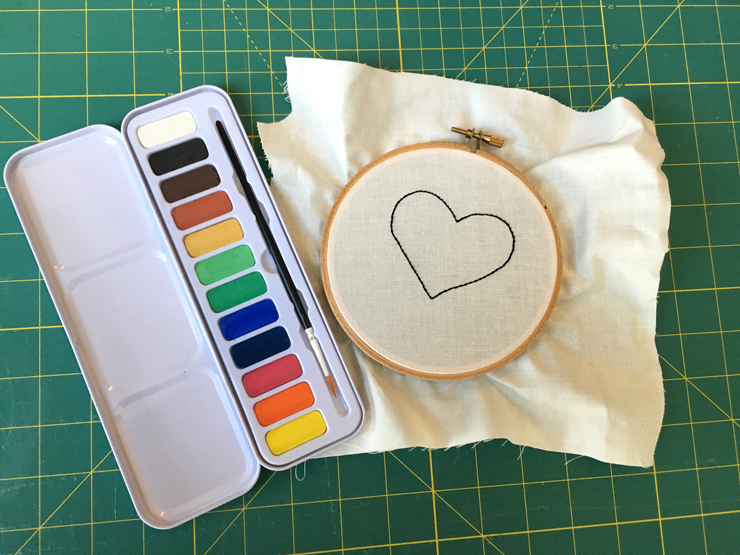 It seemed easy enough so I stitched a quick little heart and dove right in. It’s been awhile since I pulled out my watercolors but I had a lot of fun. I went a bit overboard when I got my fabric wet before I started painting, it bled quite a bit. I want to play with this technique more but I definitely need to fine tune it before I use it on any big projects. 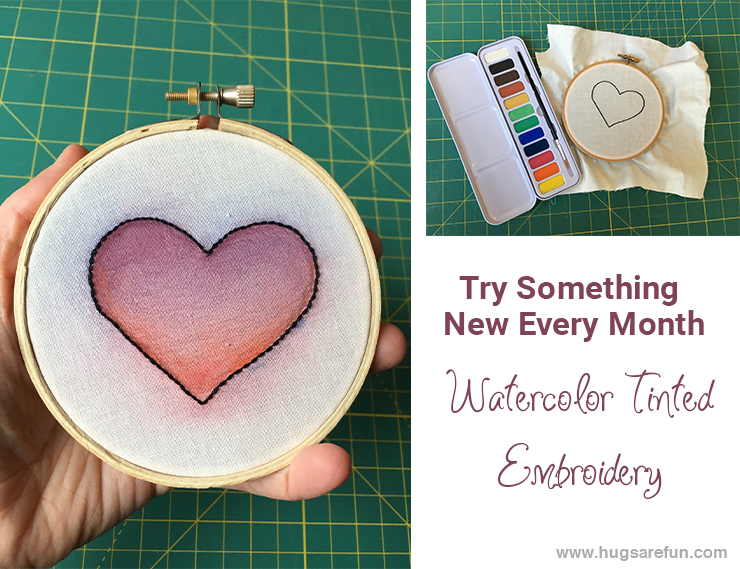 Have you ever used paint on your fabric before? Any tips or tricks? April’s theme is edible crafts. Come join the Facebook group and share your projects over there. Or add your project to April’s link up. I found that if you paint on the dry fabric first and then just put drops of water over it with your paint brush and kind of dab it, you can control where it bleeds but if you got the fabric wet first, you had much less control. Granted, I was also using felt. This gave me a great idea for a project. I’m adding it to the list. I have often used pale blue and green watercolour for a background when stitching a miniature garden scene for a card. Works well.